[red pencil below here?] Mr. Marshall W. Keith O.N.R. 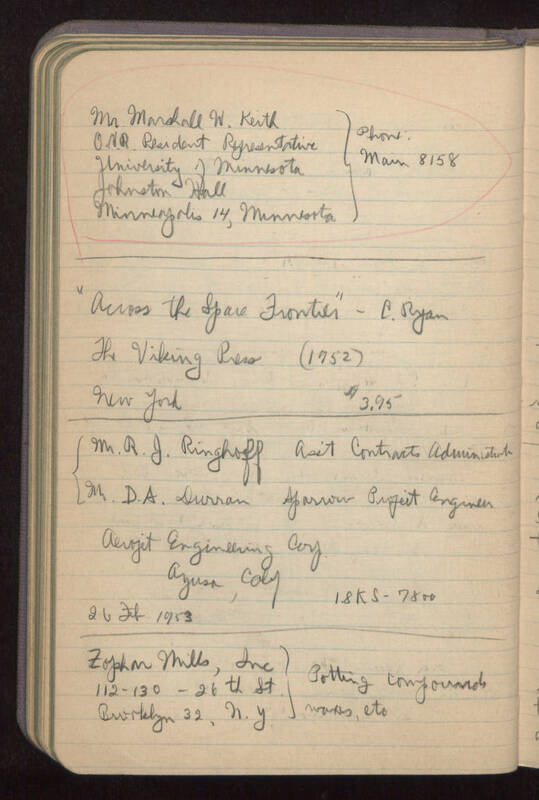 Resident Representative University of Minnesota Johnston Hall Minneapolis 14, Minnesota phone: Main 8158 [red pencil above here] ------------------------------------------------------------------ "Across the Space Frontier" C. Ryan The Viking Press (1952) New York $3.95 ------------------------------------------------------------------- Mr. R. J. Ringhoff, Assistant Contracts Administrator Mr. D. A. Durran, Sparrow Project Engineer Aerojet Engineering Corporation [Ayusa? Azusa? ], California 1.8 KS - 7800 26 February 1953 ---------------------------------------------------------------------- [Zophar? Zophan? Zophon?] Mills, Inc 112-130 - 26th Street Brooklyn 32, New York Potting compounds, waxes, etc.